I had a Friday night meeting in Delhi, so instead of returning on Saturday I took a quick trip to Varanasi, also known as Benares. 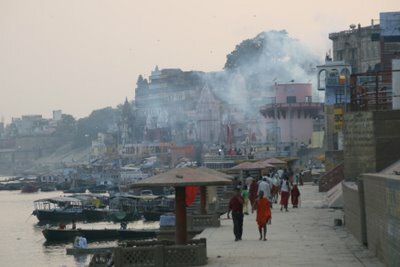 To Hindus, Varanasi is the holiest of cities, and it is one of the oldest cities in the world ---dating back more than 5000 years. Many come here to bathe in the sacred waters of the Ganges, and the devout are cremated and their ashes committed to the river. 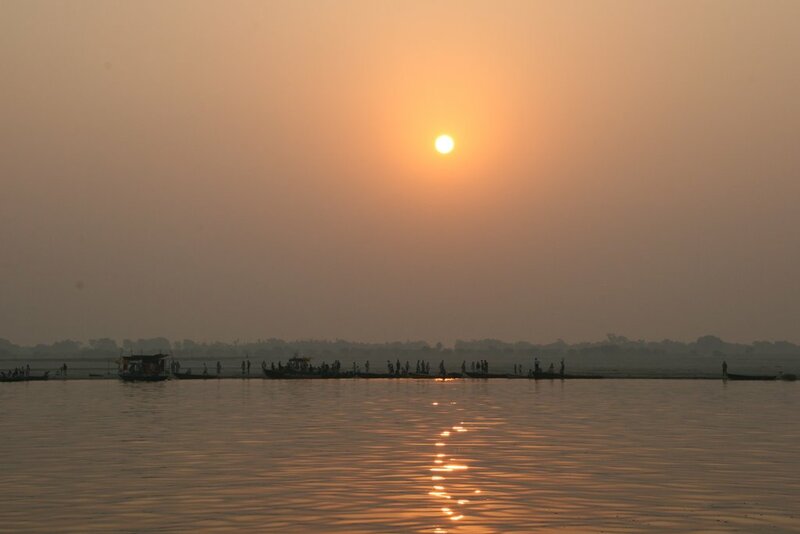 At sunrise, to take a boat ride on the Ganges is to watch a tableau of the prayful life --people bathing, washing clothes, praying, and cremating their dead. It is said that for a Hindu to die in Varanasi signfies an end to the need for rebirth. Throughout the city you see signs and pictures of Siva, one of the Hindu deities, as it is thought that Varanasi was founded by him. (Despite the large number of Hindu deities, Hinduism is, in fact, a monotheistic religion--the deities are merely the form that G-d takes). You are not allowed to take photos at the burning ghats, in deference to the grieving, but you can get quite close to the scene. There were several cremations going on in the morning. Only men participate, and certain people--pregnant women among them---may not be cremated. which is located right on the river. Getting to the guest house you walk through narrow streets filled with tiny shops, cattle, goats, and of course, tons of people. It is next door to the main location for the evening prayer, or aarti, which itself is quite an experience---took a boat to observe it from the river. The ambience of the city did remind me of Jerusalem, in more ways than one---despite this being a predominantly Hindu city, it is not at all uncommon to see Hebrew signage. I didn't get a completely straight answer for why this is, but it appears that there a number of business ventures with Israelis. 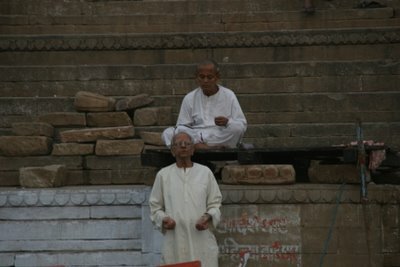 I talked to one young man, a Hindu fluent in Hebrew, who said that it has become popular to study Hebrew in Varanasi. this is my first visit to your journal. reading your archives, i couldn't help but feel that your blog was a welcome exception to other condescending expat blogs that I usually find. I see that, like others you have also observed the strange things about life in India, but somehow it just sounds different when you talk about it. I really appreciate that.